Cellist Thomas Wiebe's 2017-18 season included solo appearances in Vancouver and Toronto, and performances with Toronto's Grammy-nominated ARC ensemble at the Enescu Festival in Bucharest and the Mozart Festival in Augsburg, Germany. He also performed at the Domaine Forget International Festival in Quebec, and with the Art of Time Ensemble in Toronto. In 2018-19, Mr. Wiebe will perform a concerto with Canada's London Symphonia and give recital appearances in Guelph, Waterloo and London, Ontario with pianist Chiharu Iinuma. He’ll also perform with ARC at the Concertgebouw in Amsterdam, the Parco della Musica in Rome, Los Angeles, Massachusetts, Toronto and Calgary, and make return engagements with Art of Time and at Domaine Forget. In London, Ontario, where he resides, Mr. Wiebe collaborates with violinists Scott St. John and Erika Raum and violist Sharon Wei as part of the Rebelheart Collective, which plays string quartet repertoire, and performs with advanced string students and El Sistema Aeolian Hall ensemble. In 1995, Thomas Wiebe founded the Duke Trio, along with violinist Mark Fewer and the late pianist Peter Longworth. in London, Ontario, Canada. Mr. Wiebe has performed on numerous occasions as a guest artist with Kitchener-Waterloo Symphony Orchestra and Orchestra London Canada. He has also been heard as soloist with the Juilliard Orchestra at Lincoln Center in New York, and with the Winnipeg Symphony Orchestra. He has recorded for the CBC, Centrediscs, Doremi and Bowl labels. 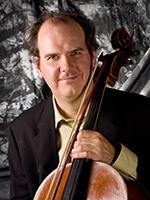 Thomas Wiebe studied cello in his native Winnipeg with the late Julie Banton. He later studied at the Eastman School of Music with Robert Sylvester and Steven Doane, and at Yale University and the Juilliard School with Aldo Parisot. He holds a Doctor of Musical Arts degree from Yale.